Drymax Hiking Lite-Mesh 1/4 Crew socks are 25% Lighter than the standard hiking sock And contain a dual layer moisture removal system that keeps your feet dry by moving liquid Such as sweat Away from your feet. Water does not stick to the inner super-hydrophobic layer and is repelled to the outer hydrophilic Drymax layer Creating a barrier that keeps moisture away from the surface of your skin so your feet remain dry and comfortable. Other hiking socks rely on moisture wicking fibers that use the slow process of evaporation to dry And in the process keep your feet wet. Drymax socks dry at the same speed as you sweat Keeping you on the trail longer.The Drymax fibers used in the Lite-Mesh Hiking socks are the least thermally conductive fibers Meaning that your feet stay warm in cold weather conditions because the sock doesn't pull heat away from your skin. 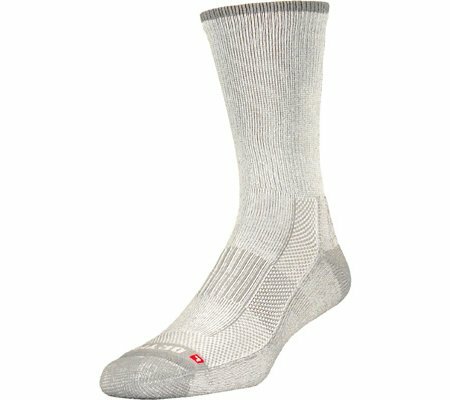 Drymax Lite-Mesh Hiking Socks are available in grey Tan and brown. Care Instructions: Machine wash warm with like colors. Tumble dry low heat. To whiten use bleach alternative. Do not use fabric softeners As they will reduce the effectiveness of Drymax fibers. Do not use chlorine bleach As Lycra Spandex stretch fibers and MicroZap antibacterial active odor control will stop working.